Here at Jetpets we pride ourselves on providing a unique service to pet owners all over Australia but often we are tasked with looking after more exotic animals for many of Australia’s wildlife conservation programs and organisations. This was certainly the case last month when we transported a male Australian Sea Lion, from Sydney Airport to Sea World on the Gold Coast. The Australian Sea Lion or “Maxi” as he is better known, was being transported to Sea World to join a coordinated breeding program between Sea World, Taronga Conservation Society Australia and ZAA (Zoo and Aquarium Association), aimed at increasing the numbers of this vital and endangered species. The Australian Sea Lion is found nowhere else in the world and their population is native to the rugged coastlines of South Australia and the southern tip of Western Australia. While the seals physical appearance is similar to other seal species, the Australian Sea Lion is unique in it’s breeding habits with females choosing to stay close to where they were raised and breeding only once every 18 months. With Maxi being such an important traveller (and Jetpets first Sea Lion), our team were determined to make sure his trip was as smooth as possible. 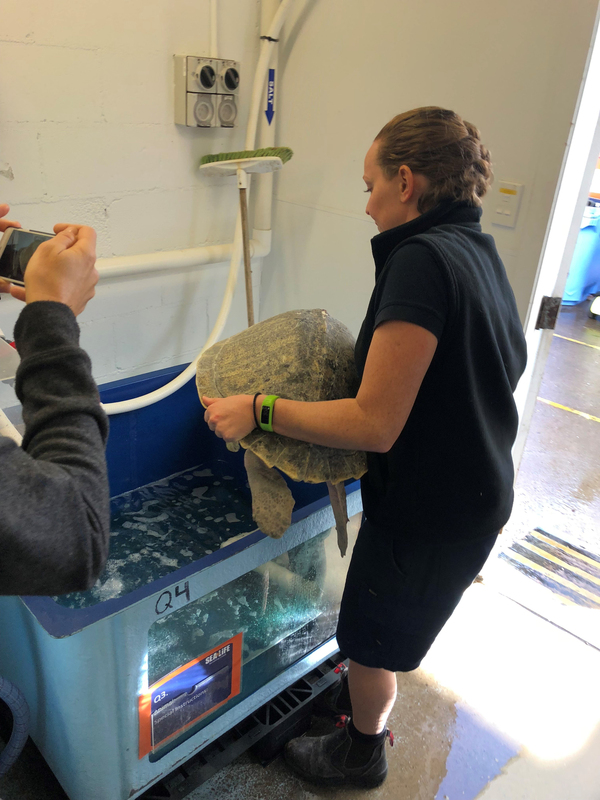 Being three years old and weighing in at 62kgs, we had to come up with travel solution that would enable us to transport Maxi the 900km distance to his new home at Sea World. 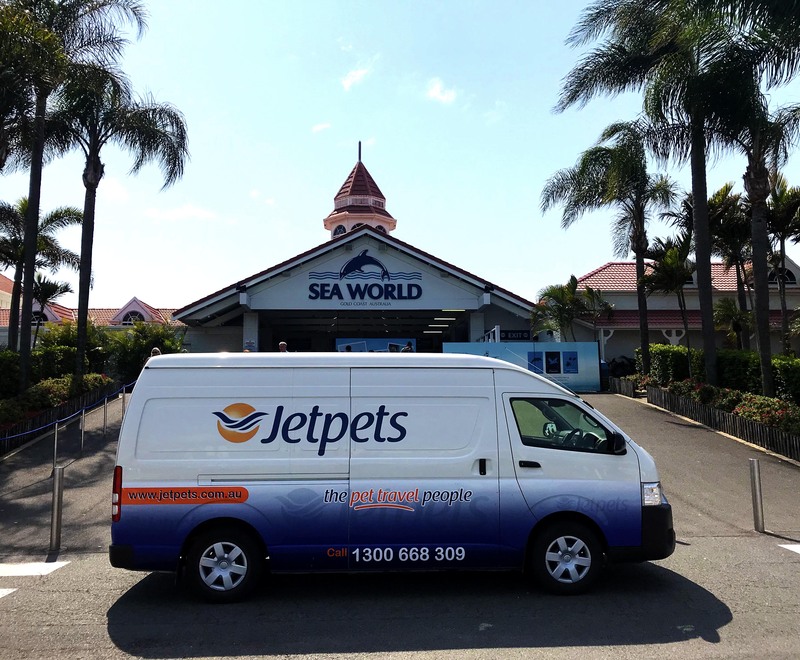 “With the support of Qantas freight staff and Sydney Airport we were able to give Maxi the royal treatment, ensuring his flight to his new home at Sea World was a smooth and stress free one.”, said Jetpets National Business Development Manager, Brett Headley. 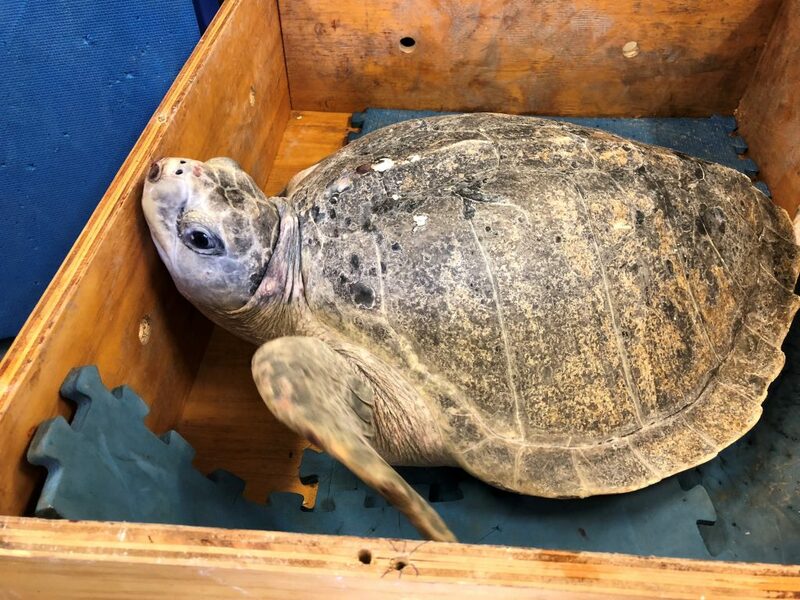 On the day of travel our team worked closely with Maxi’s Zoo keepers and Qantas freight staff to ensure that Maxi had the very best of care with Jetpets even managing to arrange to have Maxi’s keeper travel out on to the tarmac with Maxi. Maxi and his keeper spent time in a nice quiet area to prepare for their flight and upon arrival in Brisbane, arranged for his keeper to have quick access to Maxi. Upon delivery Maxi was greeted by Sea World staff who couldn’t wait to get acquainted with their new arrival, with Maxi’s keeper helping to ease the transition to his new keepers. 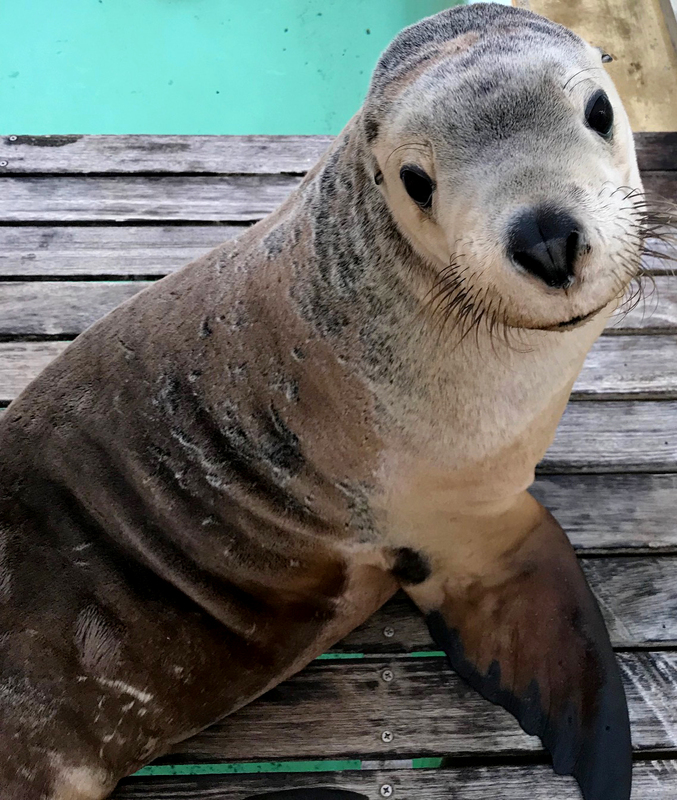 “When Maxi arrived at Sea World, he spent two weeks in our quarantine area but has since moved to our Seal Theatre area where he will join the team of Seal Guardians in our new presentation educating our guests about the importance of reducing, reusing and recycling.”, said Sea World’s Mitchell Leroy. 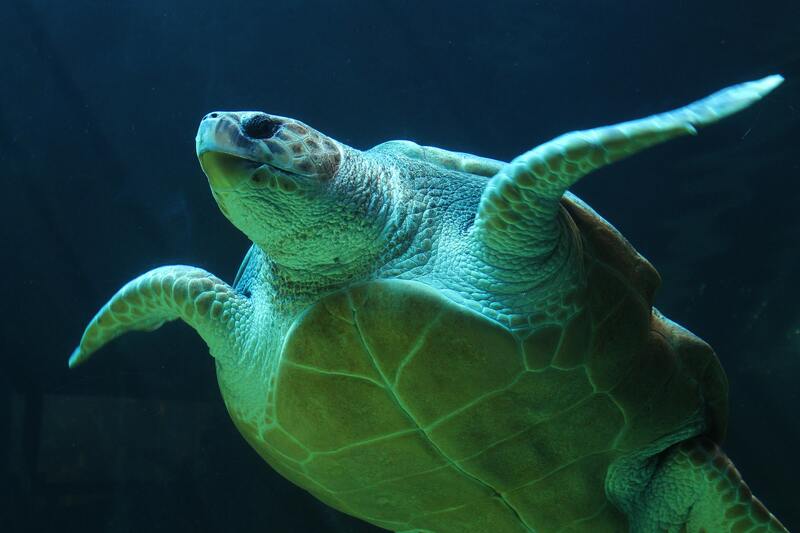 Seal Guardian is an educational presentation that will take visitors on a conservational mission to help protect the ocean from plastic pollution. “Seal Guardian is an exciting new presentation which has a really important message about the impact plastic pollution is having on our oceans and what we can do to prevent further damage.”, said Sea World’s Curator of Mammals, Mitchell Leroy. We look forward to watching Maxi develop as an ambassador for the protection of his species and spreading awareness of the importance of reducing pollutions in Australia’s oceans. Meeting some of the Jetpets workers! Do you ever travel with your pet? By air? What would you do if you had to relocate to another town or city or even country? If you love your pet, I’m sure that you’d want to take them with you. This is where Jetpets comes in. 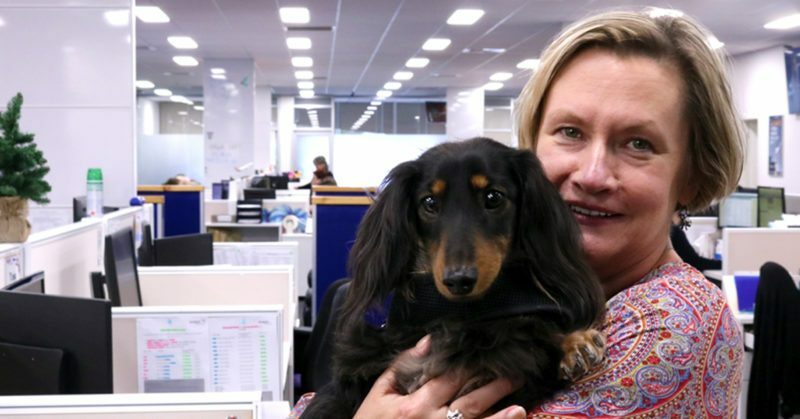 The domestic team handles state to state transport, which covers families going on holidays or moving with their pets, helping with rescue partners transport and providing a service for certified and lawful breeders. The international team work with customers relocating overseas or in some cases, adventure seekers who are travelling with their pets on holidays. The import team assists with clients immigrating to Australia with their pets, providing information about quarantine and country import regulations. 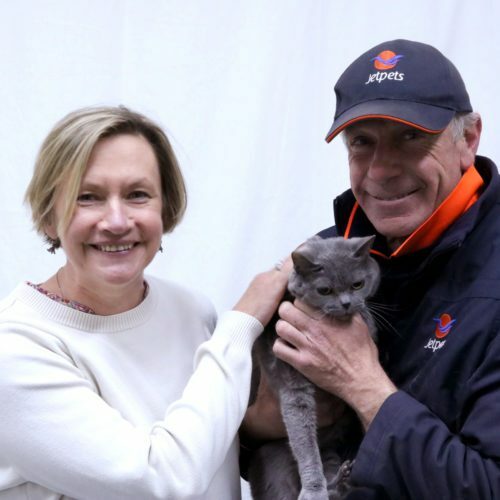 Jetpets have grown and grown over the years but still retains the comforting feel of a family business. 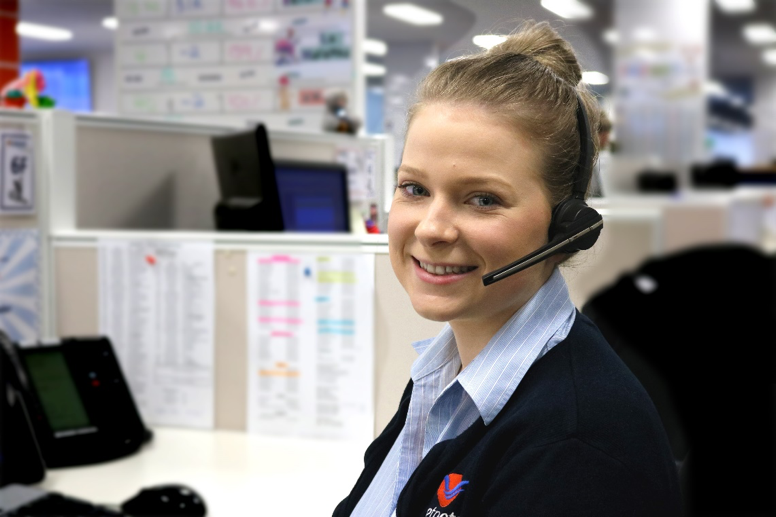 I was impressed by the level of customer service, from the initial call, right through to providing individual care for you and your pet’s (or your tiger!) needs. Obviously, pet parents worry when their pet is being transported. And Jetpets take the welfare of their pets during transport seriously. Strict processes and procedures are in place to ensure the welfare, comfort and safety of all animals in their care. This includes staff veterinarians, experienced pet handlers, all animal facilities, and customised services, to ensure that each unique travellers needs are addressed. A dedicated pet travel consultant even monitors the weather at major airports across Australia in case of extreme weather instances. I was impressed at the levels of security. Just having a carry case was not enough security for the pet. Each case was secured with numerous cable ties to ensure that no pet could escape during transportation. Even just going from room to room, pets were secured. Travelling with animal handler Dave Higgins and pets in transit, at Jetpets animal transit facilities. I toured the animal transit facilities and my thoughts are that I’d like to check in next time I have time to spare at an airport! Pet owners can bring their pets here directly prior to travel and Jetpets will take care of all their transportation needs (but if that’s too difficult, then you can arrange Jetpets to pick your pet up from home). Jetpets transit lounge facilities provide an opportunity for animal travellers to get out of the crate, stretch their legs and get some cuddles and attention from the pet handlers. All pets are continuously monitored while waiting for their flights and each pet’s needs are met, whether that be medication, diet or extra exercise. Cats and dogs are kept separately and, while I was there, the animal handlers turned the cats’ cages away from any dogs in the vicinity to prevent any direct visual exposure at the airport transit facility. Dogs are walked on grassy areas around the transit facilities. 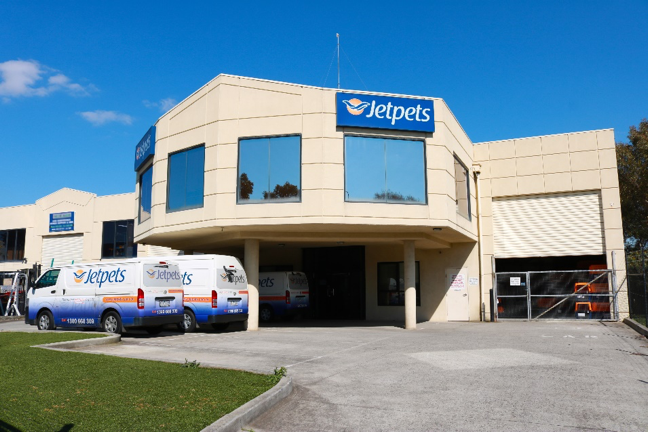 Jetpets Transit Lounge facilities are located at Melbourne, Sydney, Brisbane, Perth and Auckland and the company will interact with other reputable animal transport companies in other countries around the world. So, why move pets with Jetpets? Jetpets are aware of all laws and regulations in the country, state and area of your pet’s destination. They will be able to advise you ahead of time what you need to do to make your journey as smooth as possible. For example, if your pet needs vaccination prior to travel. 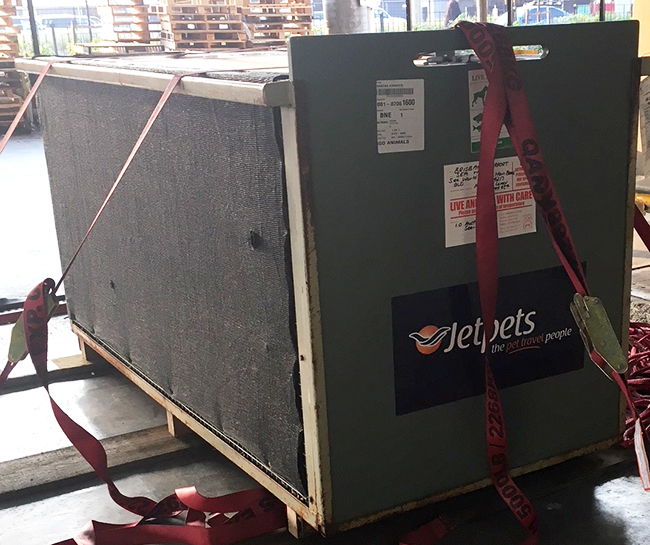 Jetpets will deliver an appropriately sized crate to your home for your pet to get used to being in a carry case. 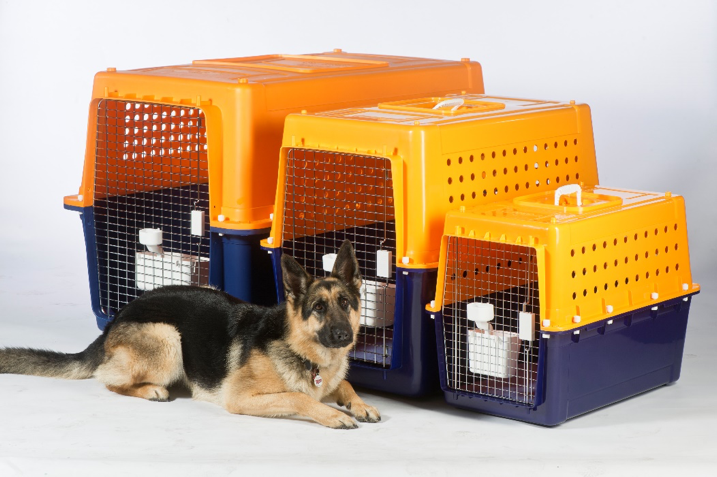 This ensures that your pet has the greatest chance of travelling stress-free, as they will be accustomed to their crate and it will feel like a secure home. Jetpets have a video to help you get your pet used to the crate (see below). 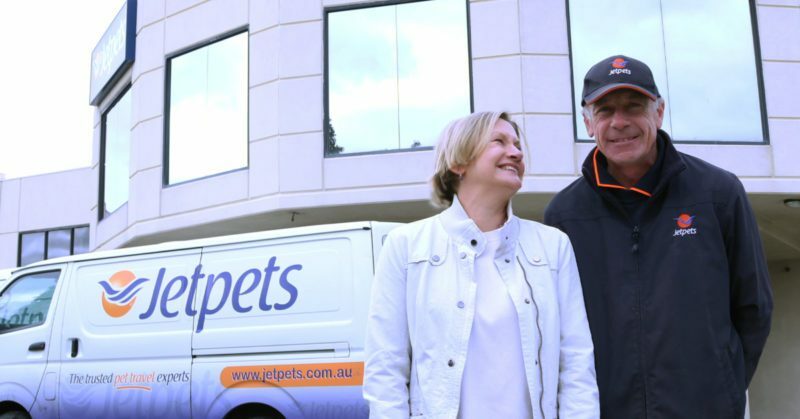 Jetpets have vets at its transit centres, ensuring that your pet is healthy during travel. Your pet will have a transit lounge to retire to, in case of flight delays or longer transit times. Just like you may enjoy access to a flight lounge, your pet will be exercised, fed and comfortable. For example, if your pet’s flight is delayed, the animal handlers will bring your pet back to the transit centre to stay until the flight is ready to depart. If your pet needs care during their transit, then Jetpets will handle it. If your cat poops, just prior to being loaded on the plane, for example, if you are solely responsible, then you may be called off your flight to attend to your cat (missing your flight in the process!). Easier to have a Jetpets handler deal with it. Your pets can be taken care of from home to home. They can be picked up from you, delivered to quarantine facilities (if required) and transported to your ultimate destination. Peace of mind for you. Jetpets offer a safe, comfortable and convenient transport service for your pet. More than this, however, they offer peace of mind for you, the pet owner. Next time you travel, consider using a pet transport company, like Jetpets, for your pet. Now Jetpets, where can I go with my pets??? Blog from Pet Problem Solved. Interpreting our beloved pet’s behaviour can sometimes be a puzzling challenge for the untrained and until our dogs are able to talk to us, (fingers crossed for soon), it’s best to rely on advice from professionals. 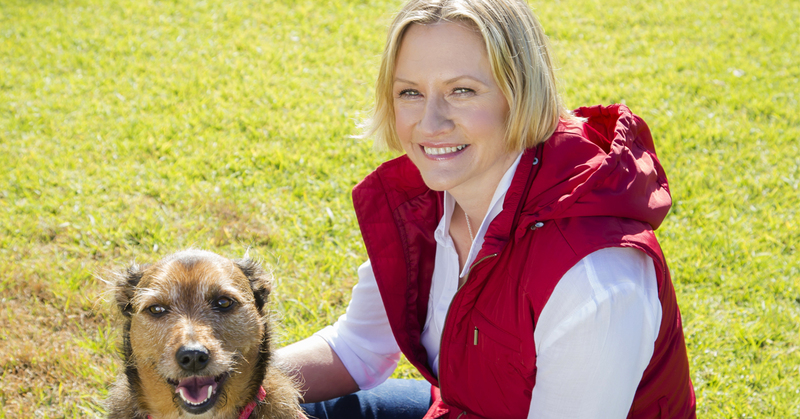 Dr Jo Righetti is one of Australia’s leading pet behaviourists and has been providing pet lovers with insightful professional advice on their pets for over 20 years. With Dr Jo Righetti joining us as a sponsor for the Jetpets Companion Animal Rescue Awards 2018 we thought it would be a great opportunity to ask Dr Jo Righetti if she had any tips or advice for those wanting to travel with their beloved pets. Many pet owners report that when they are experiencing stress, often their pet will pick up on it and alter their behaviour. To ensure that your pet doesn’t take on your stress try to eliminate situations that cause you stress when at home with your pet. You might think sedating your pet during transit could avoid anxiety or stress but in fact sedating your pet can lead to serious problems arising during travel. 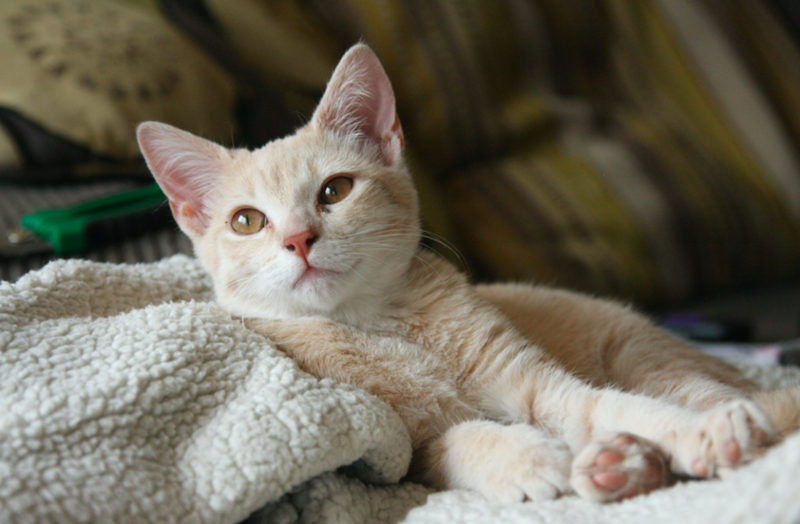 When a pet is sedated they are more likely to have breathing interference or a reaction to the medication. Sedation also results in pets not being able to drink water provided in their crate leading to dehydration risks. Our pets can be more susceptible to stress and anxiety when placed in an unfamiliar situation such as a travel crate. You can show your pet that there is nothing to fear by spending some time crate training your dog. Jetpets can bring your travel crate to your door in the weeks prior travel to give you the time you need to acclimatise your pet to the pet travel crate. Many of our clients use our services when they are moving interstate or internationally, often for a job or life change. Sometimes this can lead to a pet becoming uneasy in their new surroundings. Slow it down and introduce new environments or a new home to your pet gradually. 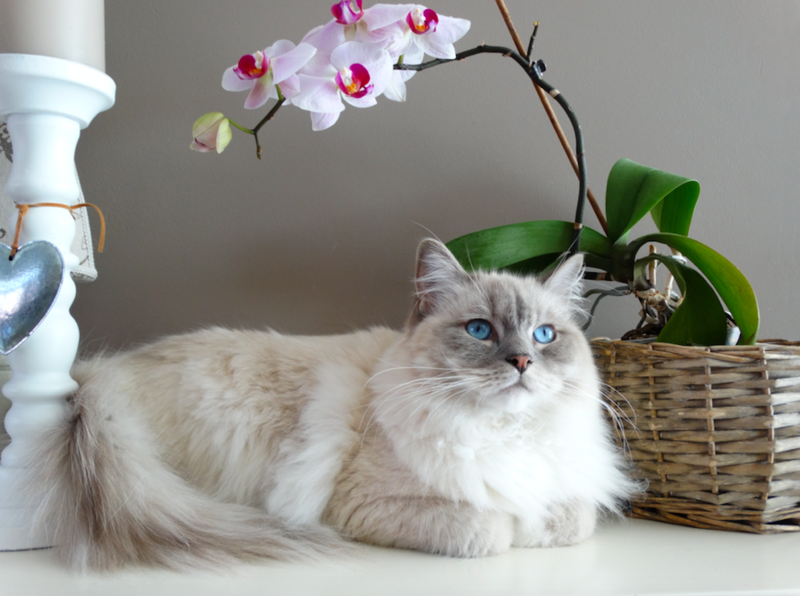 This can lead to your pet becoming more comfortable in their new surroundings. Saying goodbye to our pets to go to work can sometimes be difficult but what about if it is for a few days or even weeks? The trick here is to make it part of your pet’s routine well beforehand to avoid the puppy tears. 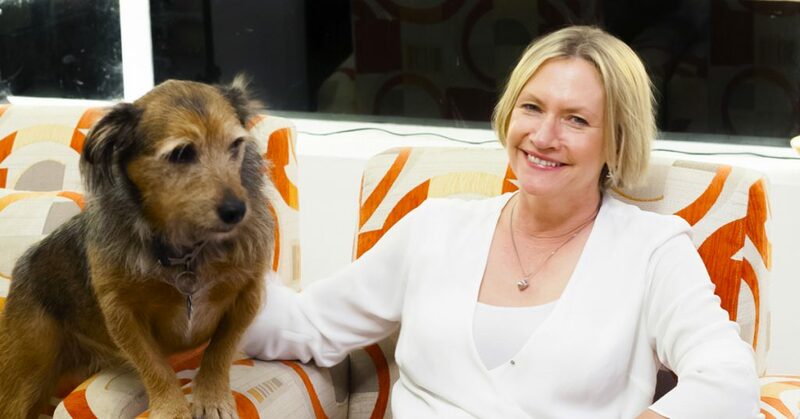 Doctor Jo Righetti is the founder of the fantastic pet resource petproblemsolved.com.au. With loads of professional advice and information on pet behaviour its your number one resource for any pet problems you may need solved. 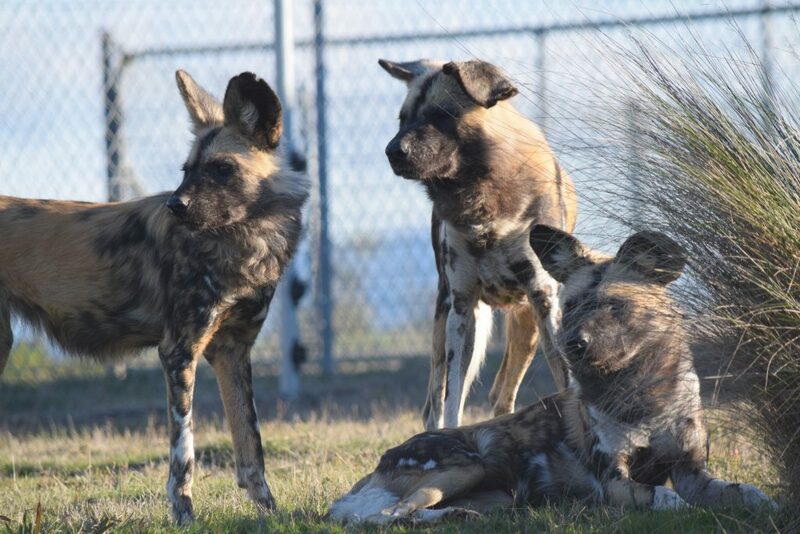 There’s some new dogs in town at Tasmania Zoo in Launceston and things are going to get wild. Two brothers Dwama and Kondo and a female, Inda have arrived recently from Perth Zoo courtesy of Jetpets. African Wild Dogs or Painted Dogs as they are sometimes called are one of the world’s most critically endangered mammal species on earth. “Our team have informed me that they travelled well, safely and have since settled into their Tassie home”, said Perth Zoo’s Danielle Henry. For generations humans have hunted the dogs believing them to be vermin while domestic animals have passed on disease like rabies which have decimated the population in Africa. The species, once numbered close to 500,000 and spread across 40 countries, have unfortunately now dwindled to 5000. Which is why the work being done at Perth Zoo and Tasmania Zoo is so important. The dogs are a fascinating species displaying keen hunting instincts akin to a SWAT team, being able to lay traps and ambushes for their intended prey or chase them down over vast distances. Their signature mottled coat gives them incredible camouflage amongst the shady clumps of trees and grasses while the patterns signify individuals, with no two dogs having the same pattern distribution. Their satellite like ears are able to pinpoint sounds of animals changing direction which helps the pack track their prey despite not being able to see them through the thick brush. 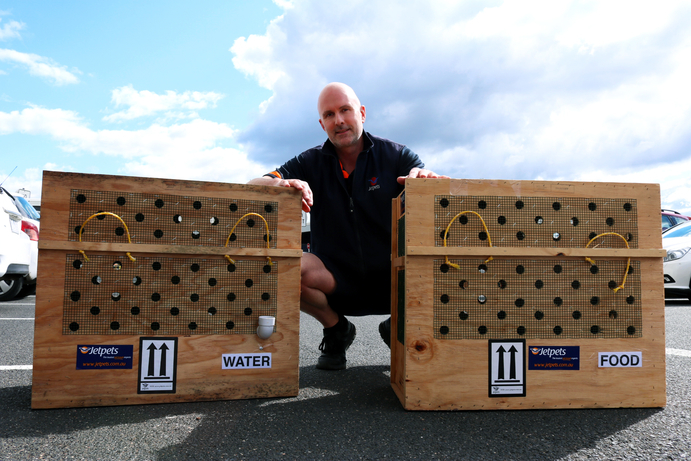 While the three new additions to Tasmania won’t be a part of a breeding program, by performing this interstate transport these three individuals from Perth Zoo it will free up more space and resources for new individuals to be raised while also raising awareness of this important and incredible species. 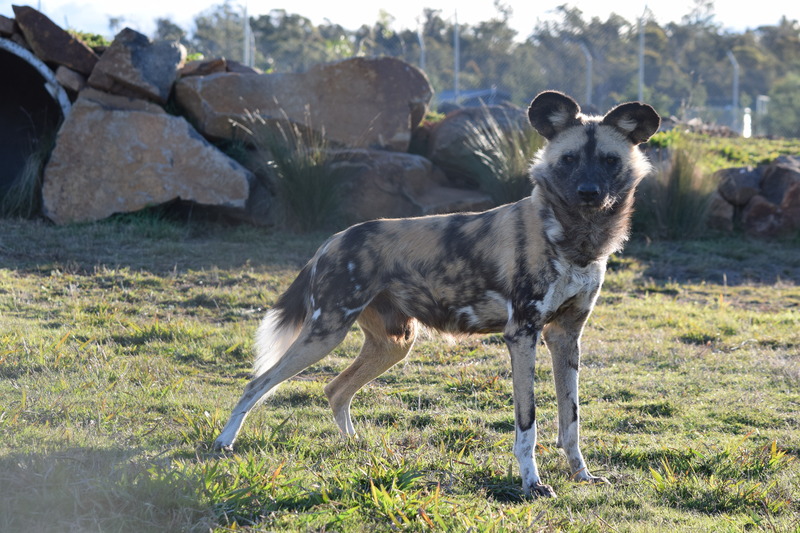 “Perth Zoo champions the cause of African Painted Dogs. 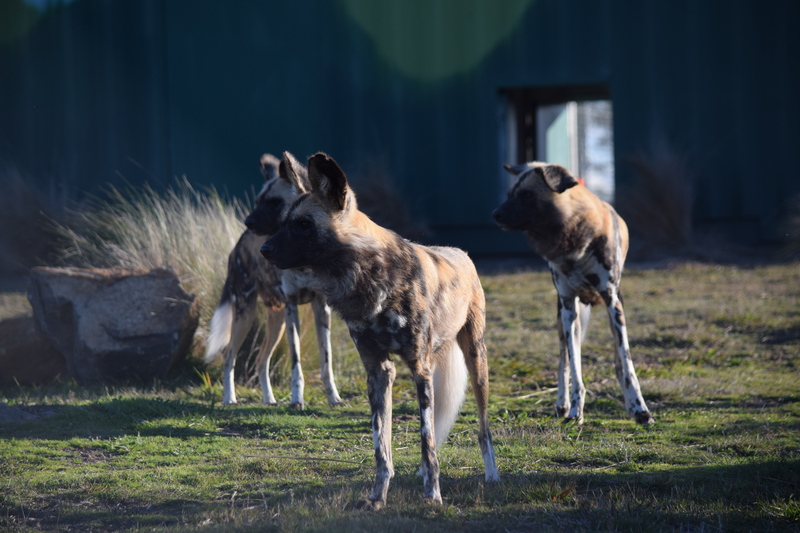 Our curator set up and runs an NGO Painted Dog Conservation Inc. which aims to protects these dogs in the wild. Amongst other activities he employs locals who conduct anti-poaching patrols and snare removal from the African landscape which causes the painful deaths of many Painted Dogs” said Danielle Henry. If you would like to see this amazing species and learn more about the conservation effort you can visit Tasmania Zoo’s website to arrange a visit or if you would like to donate to Perth Zoo’s conservation efforts you can do so by visiting their website. 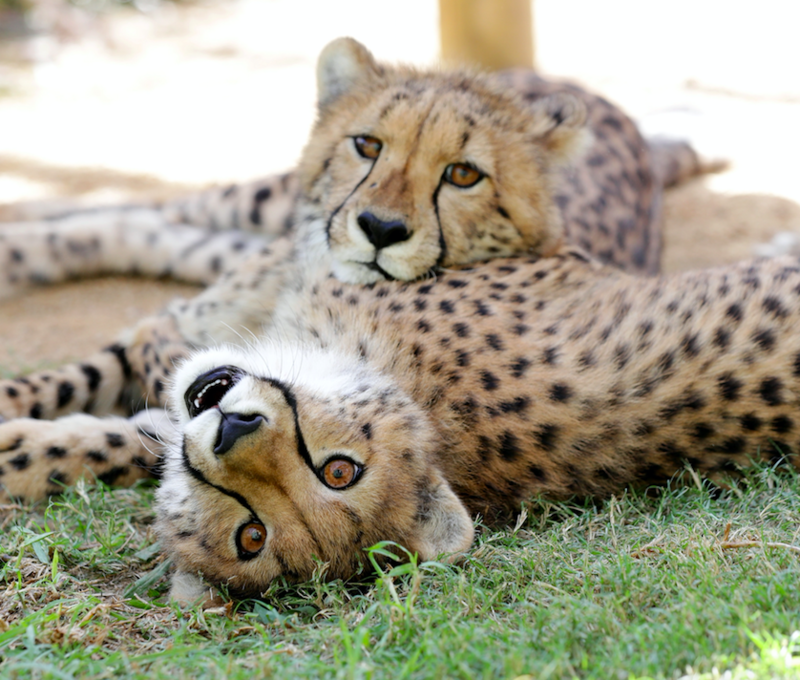 Recently Jetpets had the pleasure of assisting in the relocation of two female Cheetah from South Africa to their new home at the Wild Animal Encounter Conservation Centre in Hawkesbury, north of Sydney. 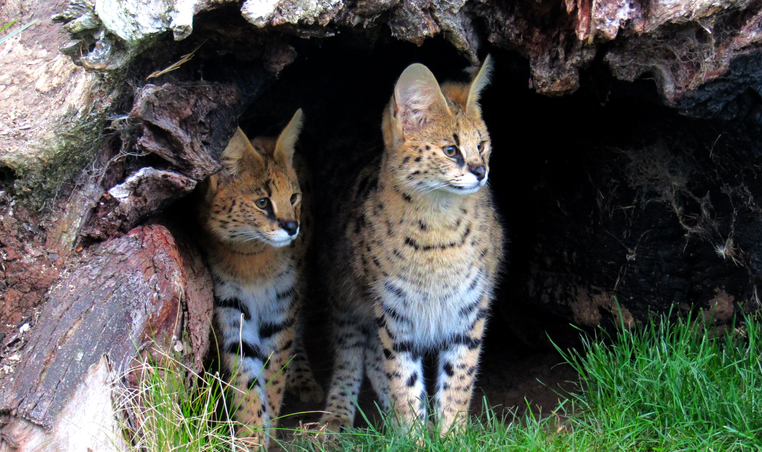 The Cheetah sisters, Ziva and Zane are joining a brand new conservation breeding program for Cheetah being established at Wild Animal Encounters. With less than 7000 Cheetah remaining on earth, captive breeding programs are vitally important as insurance populations to safe guard against extinction of species such as Cheetah. The success of the Cheetah Breeding Program in Sydney rests in the very capable hands of Wild Animal Encounter’s company Director, Ben Britton who you may recognise as the host of Australia’s Nat Geo Wild program. Ben’s name has become synonymous with exotic wildlife education and throughout his 20-year career Ben has starred in several documentaries and television programs aimed at educating the public on animal behaviour and conservation. “I’d like to thank Jetpets, and in particular the Sydney team for their assistance with this project. 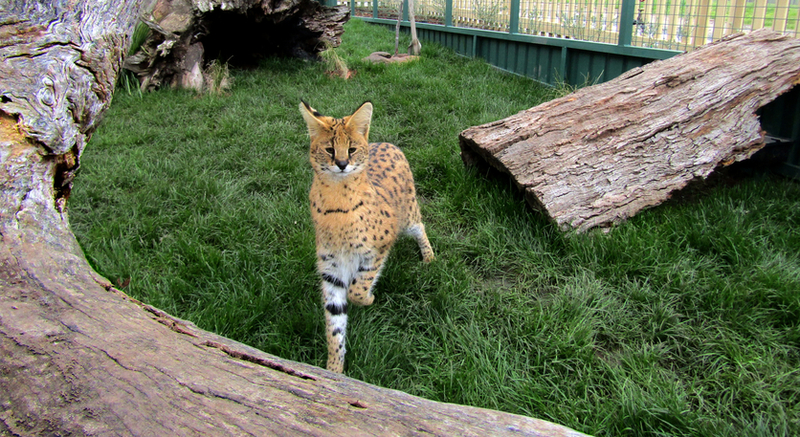 The Cheetah have arrived safe and sound, and both animals are out exploring their new environment…”, said Ben. Wild Animal Encounters is not government funded and they rely heavily on donations and the support of the public to continue their important work promoting conservation both in Sydney and in Botswana, where they have been working for over 10 years to conserve wild cat populations. Private tours of their Conservation Centre in Sydney offer the unique opportunity to meet these amazing creatures while supporting the important work Wild Animal Encounters does. We wish Ziva and Zane the very best as they explore their new environment and we will endeavour to check in with them in the future to bring you any updates. 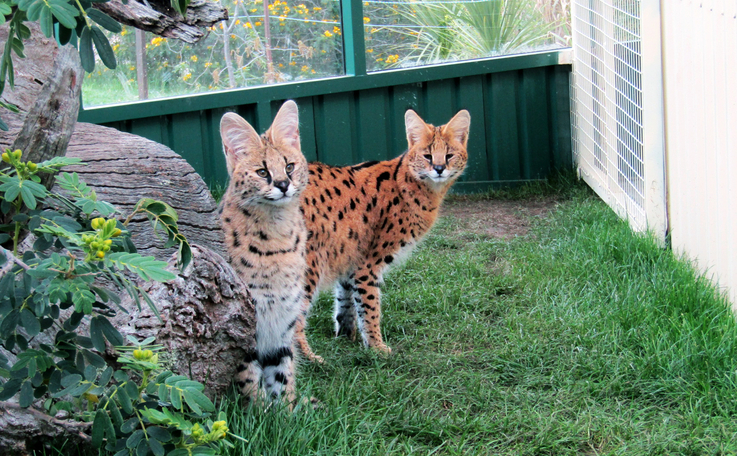 For a limited time, you can meet Ziva and Zane, just visit www.wildanimalencounters.com.au for more details. On the remote western edge of Africa, in the country of Sierra Leone, lies a great belt of tropical rainforest home to some of the worlds most unique and beautiful animals, Chimpanzees. Due to significant pressure from the illegal bush meat trade, rising human populations and deforestation, these populations are under threat. Monarto Zoo in South Australia is working directly with the Jane Goodall Institute and the Tchimpounga Chimpanzee Rehabilitation Centre to combat the threats to this amazing population. Monarto Zoo’s Chimpanzee breeding program was recently bolstered by the addition of two new females from Taronga Zoo in Sydney. Hannah and Lani were transported by Jetpets last month to join their new brothers and sister at Monarto Zoo and they are settling in, in their own unique ways. Hannah was initially nervous in meeting her new troop but quickly overcame her social anxiety to settle in to a mothering role. “They are doing really well and have settled in better than we could ever imagine. 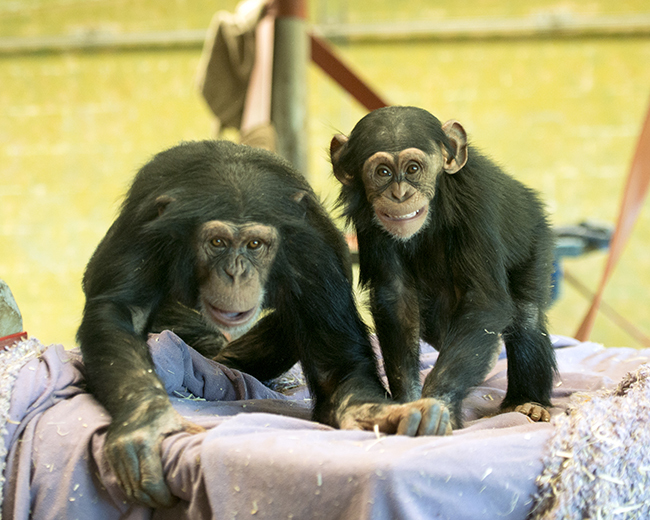 Hannah is just amazing with Enzi (our 2 ½ year old male chimp). She can be seen at times carrying him around, and he really likes her a lot. Our alpha male Tsosti has taken a liking to Hanna and is supportive of her in any disputes”, said Monarto Zoo’s Team Leader Althea Guinsberg. While the playful and social, Lani, has taken to grooming her new-found friends after sitting back and observing for a while. “Lani is doing well; in the beginning she was not happy and that affected her appetite, but this did not take long to change and soon she was foraging with the troop. She gets on well with our one adult female Galatea and the two have some great grooming sessions. Gombe, one of our males, also loves grooming with Lani and they get on really well”, said Althea. With Chimpanzees being classified as an endangered species with approximately 150,000 to 300,000 chimps remaining in the wild it’s never been a better time to support the conservation work being done by Monarto Zoo and their partners. 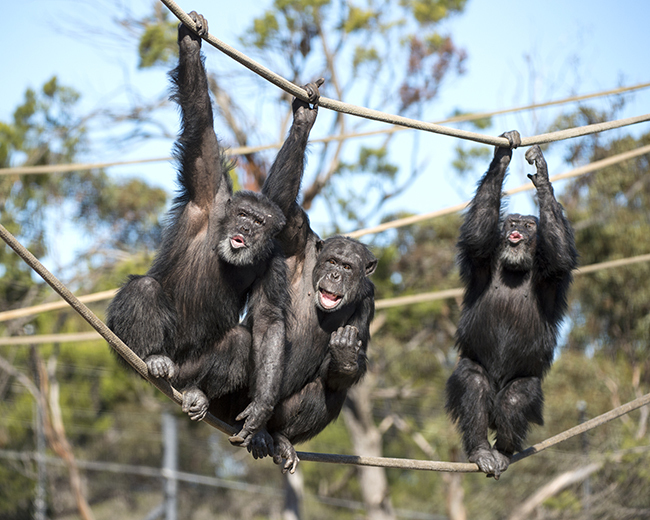 If you would like to donate and assist in the important work they do, you can do so by visiting this link or if you are in South Australia stop by Monarto Zoo for the ultimate chimpanzee experience.